Home Stretch!! Last Marking Period starts Monday! Welcome Back from Spring Break! I hope everyone had a relaxing and fun week. An important thing to keep in mind is we still have 10 weeks left so there are still things we need to learn and practice. For all of the grades, we will be working on the overhand throw. For K-2, we will be practicing and testing our skipping. We will be learning and playing kickball at all levels and, when the weather permits, we’ll be going outside. 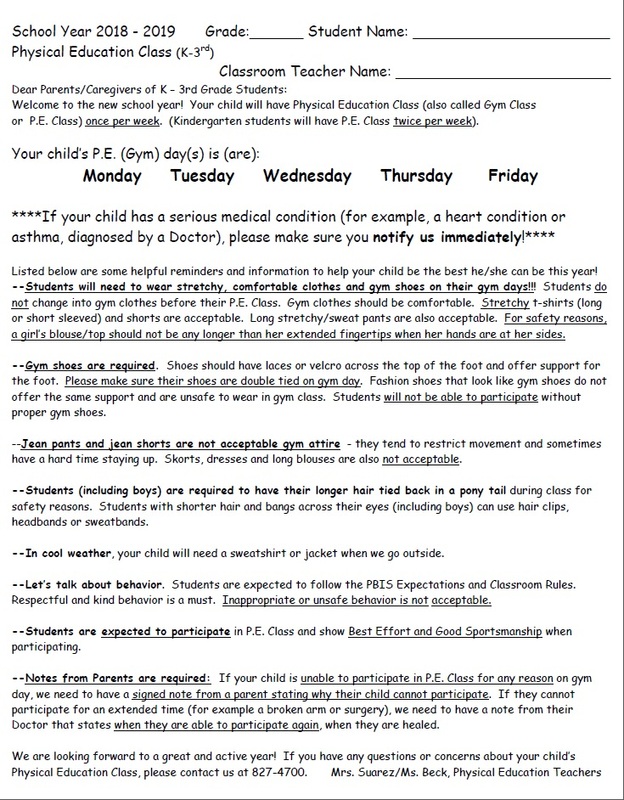 Please remember to wear gym shoes on P.E. days and dress accordingly, especially when we start going outside. I’m looking forward to the rest of this year! Let’s make it awesome!! 4 Weeks until Winter Break! With only 4 weeks until winter break, we have lots to do during PE. I would like to get the basketball dribbling test completed for all of my classes before break so we have been practicing every week in preparation for it. My K and 1st graders have been taking their galloping tests already and doing a wonderful job with it. The 2nd graders are working on jumping rope as I twirl for them and the 3rd graders are practicing jumping rope as they twirl since they will be tested on that next marking period. It is a very busy time and the most important thing is to remember to pack gym shoes if the students wear boots to school. Boots can not be worn in P.E. It is also important to eat healthy, get plenty of sleep and wash hands regularly to prevent getting sick. Stay warm! 2nd Marking Period is Here! Wow, I can’t believe we are already in the 2nd marking period and Thanksgiving is 2 weeks away! We are suppose to get some snow on Friday. I’m pretty sure we are done going outside for PE so dress your children for gym inside. Also, please remember to send shoes if they wear boots to school. This marking period, K-2 will be tested on their gallop and hand dribble. 3rd Grade will be tested on their hand dribble and will begin to practice for their jump rope test and I will be testing 4th grade on their 2 minute jump rope test. I have some awesome hand dribbling videos under the class links. Remember practice makes perfect. 3 Weeks Left of Marking Period! Wow, this school year is flying by! This week, I’ll be retesting the instep kick, as well as, the students’ hopping on one foot for K-1 and galloping for 2nd grade. Hopefully, everyone is practicing at home. I’ll also be watching how students follow directions for their sportsmanship grades. Hopefully, everyone is enjoying these beautiful fall days playing outside while the weather permits it. Don’t forget to eat fruits and veggies everyday! We are finishing up our tests, but I will offer a retest so please practice at home if you would like to improve your score. Big step or leap to the ball, bend your kicking knee and contact the ball with your instep. Watch the video under my “Class Links” as a reminder of how to do it or click the link below. All students will be testing on the instep kick for 1st marking period so please make sure to practice this at home. I have a video to watch as a reminder on the right of this page under “Class Links”. Remember, practice makes perfect! Enjoy this beautiful fall weather–spend time playing outside! I’m so excited to teach my 3rd year at Henry Ford! I am very happy with my classes so far, and I know this is going to be a fun year with so many new activities and skills to be learned. Just remember to wear your gym shoes and gym clothes on P.E. days so you can join in on all of the excitement!! K-2: First grade for PE is sportsmanship. I graded on following directions, listening, and cooperation. Second grade is for sliding. I graded on technique and tempo. Third grade is for catching a fly ball. How proficient students are at catching a ball that is tossed in the air to them. 3rd: First grade is sportsmanship. How well students followed directions, listened, and cooperated. Second grade is for jumping rope for 1 minute. 4th: First grade is for sportsmanship and conduct. Second grade is for sit ups. How many sit ups students did in 1 minute determined their grade. Remember to bring gym shoes on PE days!!! We will be going outside when the weather gets a little warmer so come prepared for those days…I can’t wait!! Please Bring Gym Shoes To Wear In PE.. It is snowy and cold outside but please remember to pack gym shoes to wear in PE class. 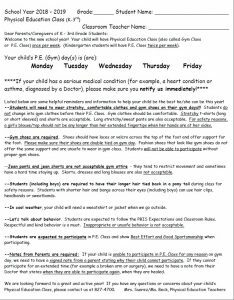 It is not healthy or safe to wear snow boots or dress shoes and boots in PE. Thanks and have a wonderful warm day!! We are retesting the hand dribble and jump roping in the classes this week and next before the end of the marking period. It is very important that everyone brings gym shoes to wear in class. It is not safe or healthy to wear snow boots or dress boots and shoes in gym. Thanks so much and stay active! Common throwing mistakes made by beginners!